Imagine a day when you have party at home and the music system is not working. You are expecting a guest, and your air conditioner is not cooling up to the mark. Kids want to watch their favorite cartoon, and television display has gone blank. You have a presentation to prepare, but your laptop hangs on you. You are expecting an important call, and your smartphone is not responding. These experiences are common nightmares in our day-to-day life, and are harrowing experience as well. Finding the right technician or expert is very difficult as there is good chance that the local technician may not solve the issue even after spending a good amount of time. This is a very fast growing market - number of devices in a household is exploding and internet of things is becoming a reality. With this, maintaining devices is becoming increasingly difficult for the consumers. This is primarily because the segment is highly unorganized and fragmented, with customers being forced to choose between expensive services at authorized centres and unreliable services from unorganized, mom-and-pop stores. The lack of transparency in pricing and reliability of repair services is also a concern. Sensing a market opportunity, Helpforsure is doing its bit to bring some relief to customers in electronics repair sector. Helpforsure is the idea of three enthusiastic entrepreneurs - Rajesh Bhatia, Kusum Shukla Bhatia, and Utkarsh Gupta. The founders realized the state of the device repair industry owing to the trying experience they suffered in getting their devices repaired at some point or the other. This was the pathway for a transparent, tech-enabled platform that leveraged technology to deliver value-driven, high-quality repair and maintenance services for electronic devices, home appliances and other local home services, leading to the inception of HelpForSure Home Services. The company is committed to ensure that the users get high quality services, at best price, without running from pillars to posts. 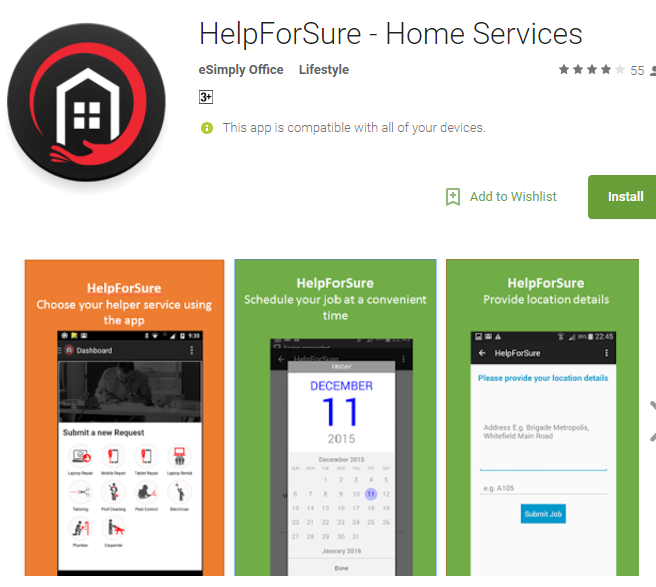 Helpforsure has already created a niche for itself in the electronics repair space that includes Smartphones, Laptops and Home Appliances such as refrigerators, ACs, LED televisions etc. The company plans to procure quality parts directly from the source and deliver them to the consumers in the repair. The supply chain benefit will be passed on to the customers. The founders plan to move 30% of the repairs through online mediums using Artificial Intelligence (AI) and chatbots. “This is the future of repair, and we want to be the first few in the category to use technology to solve issues. We also plan to file a few patents in this niche/nascent area” said Ms. Kusum.The founders have considerable expertise in filing patents and IPs. Helpforsure has made consistent growth in this sector through its different approach and customer-centric offering. “We are currently operational in Bangalore and are planning to expand to Chennai, Mumbai and NCR after the complete concept validation, and are seeking active funding in another 2 months”, Utkarsh Gupta reported. Founder Rajesh Bhatia says that Helpforsure has witnessed 30% growth (month on month). “We are expected to touch 500 electronic repair transactions per month over the next 2 months”, says Rajesh.